As the chart shows silver prices have been trading in a range of approximately $35.00 to the high side and $27.50 at the lower end for over a year now. The oscillations appear to be a lot less volatile of late which is surprising given the financial turmoil in Cyprus. 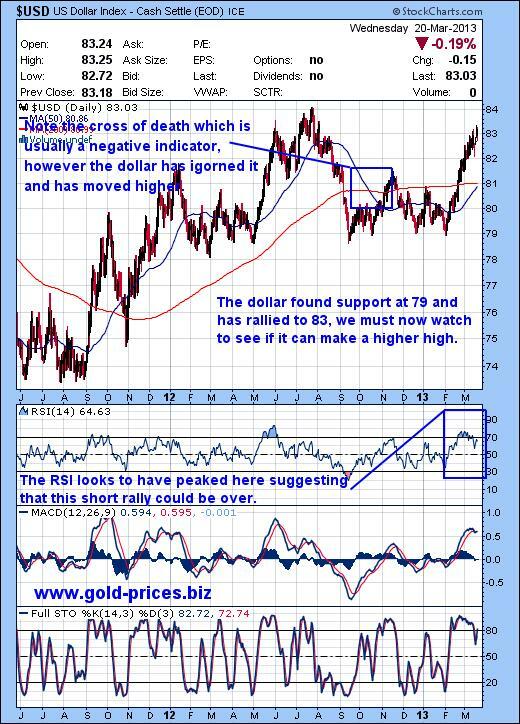 Usually when there is uncertainty in the financial markets gold and silver are seen as safe havens and experience some upward price pressure. Gold has moved higher to trade at $1610/oz but silver which formed a recent bottom at $28.50, has traded at that level for the last couple of weeks. The 50dma, in a downward move has crossed over the 200dma forming the cross of death which is usually negative for silver prices. The beneficiary appears to be the US dollar which rose to 83.03 on the US Dollar Index today. There is also the FOMC meeting which occupies traders and investors alike for two days this week, so all eyes have been focused on Ben Bernanke. Any indication that QE was about to be reeled in would have been detrimental to the precious metals sector, but it would also stop the stock market in its tracks as the economy is generally regarded as still being in a fragile state. So we got more of the same with QE continuing at the pace it is now. The creation of more dollars is usually a precursor to inflation, but again silver prices appear to be ignoring this possibility. It feels as though the summer doldrums have arrived early this year so we could be in for an extended period of 'eerie' quiet before the fall, which on a seasonality basis is usually very positive for both gold and silver prices. In conclusion the precious metals space is hazy right now so doing nothing until the picture becomes a little clearer may be the way to go.